Their movements may look effortlessly graceful from the mezzanine, but ballet dancers are some of the most hard-core athletes in the world—training and performing for up to six hours a day. In fact, most traditional athletes "train in phases and work towards peaks," Sara Matthews, the director of the Central School of Ballet, once said in an interview. "As a dancer, you are pretty much performing throughout the year." If anyone is going to be picky about the performance of their workout gear, it's ballerinas. So we decided to do some research to find out professional ballet dancers' current favorite activewear pieces. Want to see the leggings, sports bras, sneakers, and more that ballerinas like Misty Copeland and Isabella Boylston swear by? Just keep scrolling. 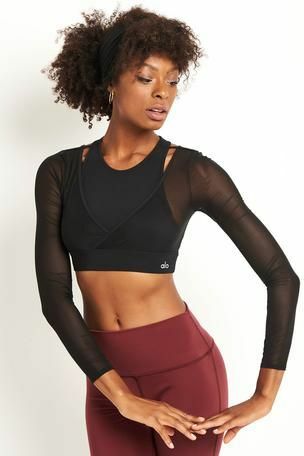 Sassy Gregson-Williams, a ballerina and the founder of the online workout studio, app, and recipe platform Naturally Sassy, is hooked on this flattering wrap top in black for working out. "This is one of my favorite stylish workout pieces with beautiful and breathable mesh detail," she says. "I'm a big fan of tops like this one that have a built-in bra for extra support." Earlier this fall, Lululemon teamed up with principal dancer Francesca Hayward of the Royal Ballet in London to create a collection of "studio-to-street" activewear, and this ultra-soft, breathable jumpsuit is one of the key pieces. "The feel, it's amazing against my skin," Hayward told Elle UK. "And I love the colors, too. That was my problem with dancewear before. … They were pink and flowery, and so stereotypical. I just think let's move forward and not be so old-fashioned. I don't need to be a pink ballerina." Gregson-Williams calls these trainers her favorite sneakers to date because not only are they streamlined and stylish, but they're also ultra-lightweight and bendy. "Having been used to wearing a thin ballet slipper for most of my life, I like being able to have good flexibility through the foot," she says, "and these shoes give that to me." One of the most famous ballerinas in the U.S. right now is no doubt Misty Copeland, who just launched her first collection of activewear in collaboration with Under Armour. These super-soft and stylish sweat-wicking leggings are a highlight from the line. "I love ToeSox because they keep my feet warm during the cold months," says Jacqueline Hinton, a freelance ballet dancer in Los Angeles. "Plus, they keep me from slipping in Pilates and yoga." Another piece from Hayward's collection with Lululemon, this light-support, longline bra was inspired by vintage corsetry and is absurdly flattering. It features an open back, wide straps, and tons of stretch. When she isn't dancing, Isabella Boylston, a principal ballerina with the American Ballet Theatre, can almost always be found in a leotard, shorts, and Nike sneakers. "I dress more for comfort because I have to take care of my body, and a lot of times I’ll be dealing with injuries," she told Who What Wear in an interview last year. Nike sneaks are her favorites for both comfort and style. "These leggings remind me of pointe shoelaces with their intricate and eye-catching side detail," says Gregson-Williams. "They are extremely flattering, and beyond style, they’re very comfortable too." Reformer Pilates is one of Hinton's favorite ways to cross-train, and she loves being able to bring her own hand-and-foot loops to her studio. "I love these loops because I don’t have to share the communal Pilates loops at the Pilates studio anymore," she says, "and they are really cute too!" Gregson-Williams swears by this chic Lululemon bra for the proper fit and support she needs while dancing. "I've always struggled to find a bra that fits well," she says. "I'm very narrow with a full chest, and that doesn't often bode well in finding bras that fit and support. The Lululemon energy bra has become my go-to with very simple matte colors and a pretty interlaced back. Simple and supportive." "Fashionable, maybe not," says Gregson-Williams, "but my FlipBelt might be one of my most used workout accessories." The product sits on your hips and can fit your phone, keys, wallet, or whatever else you might need to on your person while you work out. Gregson-Williams got hers on Amazon on a whim and "would recommend to anyone in a heartbeat." These are Hinton's favorite sneakers because "they are so light but very supportive for cross training." Not to mention affordable. Misty Copeland is never found warming up without a loose-fit sweater, which is why she created this one with Under Armour and called it her signature. The breathable but warm 100%-cotton top has a relaxed fit, a keyhole slit in the back, and a dropped hem in the back with vents on the sides. Next: A trainer over 40 shares her best fitness tips.